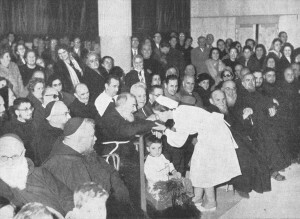 Padre Pio at the Home for the Relief of Suffering attends a program in the auditorium. A staff nurse greets Padre Pio and kisses his hand. Prayer was the key to Padre Pio’s existence and the guarantee of his mission. Prayer was his daily activity. He also dedicated many hours of the night to prayer. It was the task which he felt was particularly his own, and which drew upon him the attention of the whole world. At the altar, in his cell, or in the monastery garden, with his hands folded in prayer or holding his Rosary, his world was God – to be contemplated, to be praised, to be entreated, to be propitiated. More than anything else, his was a life of prayer, of uninterrupted conversation with God. Laurino wanted to accept the invitation but there were many obstacles in his path. For one thing, he had no money for the train fare from Padua to Padre Pio’s monastery in San Giovanni Rotondo. Nevertheless, the desire to visit Padre Pio was growing stronger and stronger each day. One day he decided to hitchhike to the train station in Padua, even though he did not have the money to buy a ticket. When Laurino arrived at the train station, he happened to run into a friend. “What brings you here, Laurino?” his friend asked. “I am hoping to go to San Giovanni Rotondo to see Padre Pio,” Laurino said. “He has invited me to visit him.” Laurino then explained that he could not afford to purchase a ticket. It so happened that a man who was standing close by overheard the conversation. “If you would like to come along with me, I am driving to San Giovanni Rotondo,” the man said to Laurino. Laurino was amazed at the wonderful way things were working out in his favor. Without his even asking for help, he had been offered free transportation to San Giovanni Rotondo. He happily accepted the man’s invitation. The man turned out to be Dr. Giuseppe Gusso, a close friend of Padre Pio’s and the medical director of Padre Pio’s hospital, the Home for the Relief of Suffering. At the monastery of Our Lady of Grace, Laurino attended Padre Pio’s early morning Mass. Afterward, he followed a large group of men into the sacristy to receive Padre Pio’s blessing. Among the many men who were gathered in the sacristy, Padre Pio noticed Laurino and stared at him intently. He motioned to Laurino with his hand to step forward. Padre Pio repeated the words a second time, “Laurino, go over to the hospital and prepare food for my sick.” Just the thought of it filled Laurino with profound fear. However, Padre Pio was insistent. “If I go to the hospital kitchen and try to cook, will you help me?” Laurino asked. “Yes, I will be there with you and I will assist you,” Padre Pio replied. Laurino walked out of the church and across the plaza to Padre Pio’s hospital. The year was 1958. As soon as he entered the hospital, he was introduced to one of the nuns who worked there. “You must be the new cook for the hospital!” the nun exclaimed. “We have been waiting for you anxiously and are so glad that you have arrived!” Laurino was dumbfounded at her words. Laurino was even more shocked when he walked into the hospital kitchen. Standing before him were a number of the kitchen employees. They stared at him in silence, obviously waiting for his instructions for the day’s meal preparation. He looked around and noticed the massive ovens, stoves, refrigerators, and sinks. The pots and pans looked large enough to feed an army. Just looking at the huge kitchen and the variety of cooking equipment was a frightening experience. As Laurino continued to look around the kitchen, his fears began to subside. Suddenly, everything seemed strangely familiar to him, as though he had always been a cook. He felt confident that he could do what was required of him. He then proceeded to give the instructions to the kitchen staff. That first day on the job, Laurino cooked for 450 people. Laurino had only intended to stay a day or two in San Giovanni Rotondo before returning to his family in Padua. But suddenly he had a steady job and an income. He was the head cook of the Home for the Relief of Suffering. It was unbelievable but true. He cooked not only for the patients but also for the doctors, nurses, and all other employees. Padre Pio encouraged Laurino to bring his wife and children to live in San Giovanni Rotondo but Laurino did not want to. He felt sure that his family would not like living in the small southern town. His own first impressions of San Giovanni Rotondo had not been favorable. It was very different from Padua. But Padre Pio was insistent that Laurino bring his family to San Giovanni Rotondo and so he did. Laurino was very grateful that he had a job. He knew that it was because of Padre Pio’s prayers that he had been hired on as the head cook at the hospital. It was a blessing to be working so close to the monastery and to have the opportunity to see Padre Pio regularly. For a reason that he was not quite sure of, Laurino began to have doubts about Padre Pio. He began to question Padre Pio’s sanctity and could not seem to shake the doubts. “Yes, Padre Pio is a good priest,” Laurino would say to himself, “but I don’t think he is a saint.” The uncertainty about Padre Pio plagued Laurino for a period of three years. He never told anyone about it, not even his wife. One day, when Laurino was about to make his confession to Padre Pio, he was shocked to see a deep cross on Padre Pio’s forehead. Blood was running down his face from the cross. Laurino began to tremble. He called out to Padre Pio but Padre Pio made no reply. He reached into his pocket for his handkerchief so that he could wipe the blood from Padre Pio’s face but his hand seemed to freeze in his pocket. He could not move. Padre Pio stared at Laurino in silence. All that Laurino was able to do was to stare back at him. He felt like he was going to faint. Finally, after about ten minutes, Padre Pio made a deep and long sigh as though he was coming back to awareness of the world. He then asked Laurino how long it had been since his last confession. “It has been nine days,” Laurino replied. Padre Pio began to name, one by one, the sins that Laurino had intended to confess to him. As Padre Pio pronounced the words of absolution, the cross on his forehead began to disappear. The experience with Padre Pio had been so intense, that Laurino let out a shriek as he was leaving the confessional. The others who were waiting in line to make their confession thought that perhaps he had been reprimanded by Padre Pio. Laurino began to cry. He cried for three days and three nights. Try as he might, he could not get control of his emotions. He prayed the Rosary constantly. He lost his appetite. It was very difficult for him to get to sleep at night. Every time he closed his eyes, he saw Padre Pio bleeding from the cross in the center of his forehead. It was impossible for Laurino to get the image out of his mind. Laurino wanted with all his heart to regain his peace of mind. His world had been turned upside down by his experience in the confessional. He decided to talk to one of the Capuchins about what had happened. He told Father Clemente the full story and asked him what he thought it meant. Father Clemente did not have an answer as to why Padre Pio had revealed himself to Laurino in such a way. He advised him to speak to Padre Pio directly and to ask for an explanation. Laurino decided to do what Father Clemente had suggested. One day he walked to the monastery, intending to ask Padre Pio for an explanation as to what had happened in the confessional. He was almost at the monastery door, when he lost his courage and turned back to walk home. A short distance from his home, he decided to make another effort. Once again, he retraced his steps to the monastery. At the monastery, Laurino went to the area where the Capuchins had their private quarters. He saw Padre Pio standing right outside of his cell, leaning against the door. As soon as Laurino came into view, Padre Pio looked in his direction. Laurino had the feeling that Padre Pio had been expecting him. Laurino suddenly became very nervous. He wanted to talk to Padre Pio about what had happened but at the same time, he knew that he did not have the courage to do so. He turned around to walk away but he suddenly felt frozen to the spot. He was unable to move. “Laurino, what is the matter?” Padre Pio asked. Try as he might, Laurino was not able to utter a single word. Laurino finally found his voice and said, “Padre Pio, when I made my confession to you, I saw a cross on your forehead. Blood was dripping down your face from the cross. Why did you allow me to see you suffering so much? What did it mean? Is it because of my sins that you suffer like you do?” “No, of course not,” Padre Pio replied. “It was a grace that God gave you. It is that simple.” From that moment on, peace returned to Laurino’s heart. He finally understood. God had given him that experience in order to dispel the doubts he had about Padre Pio’s sanctity. After speaking to Padre Pio, the doubts vanished and never returned. Shortly before Padre Pio died, Laurino told him that he was going to take a brief vacation. “No, do not go,” Padre Pio said insistently. But Laurino explained to Padre Pio that he felt the need to take the time off. “How many days do you plan to be away?” Padre Pio asked. “I want to go for seven or eight days,” Laurino replied. “Use five days for your vacation but no more,” Padre Pio said. Laurino agreed to his request. It wasn’t long before Laurino understood why Padre Pio had insisted that he be gone for no more than five days. Laurino was back in San Giovanni Rotondo when Padre Pio passed on to his eternal reward. Sister Pia D’Apolito, who was born and raised in San Giovanni Rotondo, had contact with Padre Pio on several occasions during her youth. She was just fifteen years old when she met Padre Pio for the first time. She described him as being “very kind and very handsome, with gentle manners, even though he could be severe on occasion.” He was thirty years old at the time. Like all of the other citizens of San Giovanni Rotondo, Sister Pia and her family were very much aware of Padre Pio’s reputation of holiness. They were also acquainted with his parents, Grazio and Giuseppa Forgione. Sister Pia never forgot the time Grazio and Giuseppa paid a visit to their home. They were very worried about Padre Pio’s exhausting schedule at the monastery and said, “Our poor son, they are going to kill him by making him stay so long in the confessional!” They were also deeply concerned about his deteriorating health but felt at a loss to know what to do to help him. Sister Pia’s brother, Brother Giovanni Crisostomo, was one of the Capuchin students who lived at the monastery of Our Lady of Grace. In order to assist him in meeting his financial obligations, the superior of the monastery made a special arrangement. In exchange for the monthly fee of fifteen lire, which the family could not afford to pay, Sister Pia and her mother agreed to take care of the washing and ironing of the laundry of Giovanni Crisostomo and two other Capuchin students. Every Saturday the clean laundry was delivered to the monastery and the laundry that needed to be washed was picked up. In the monastery of Our Lady of Grace, Brother Giovanni Crisostomo had been given the job of assisting Padre Pio with many of his daily tasks. Every morning he went to Padre Pio’s cell and helped him wash his wounds. He would describe in detail, the terrible wounds on Padre Pio’s body. Although the stigmata caused great pain and suffering to Padre Pio, he never complained, and that made Brother Giovanni Crisostomo admire him all the more. Later, Brother Giovanni Crisostomo was sent as a missionary to East Africa where he contracted malaria and passed away at the young age of thirty-two years. Padre Pio was very grieved when he learned about his death. As time passed, Sister Pia D’Apolito felt the call to a religious vocation and after much prayer and reflection, she made application to the Dominican congregation and was accepted. Later, she was sent to the monastery of St. Anthony in Gubbio, Italy, a town that was made famous by St. Francis of Assisi. From time to time she was able to return to San Giovanni Rotondo for a family visit. She spent most of the days in the church at Our Lady of Grace because she wanted to be close to Padre Pio. Throughout her life, he remained her inspiration. My daughter Nicole was pregnant with identical twin girls and had a medical crisis. Her due date was Sept. 24, 2011. On Sunday, June 19, 2011, my daughter was feeling significant pain in her side and called her doctor to advise him. The doctor told her it was probably the twins resting on a nerve but scheduled an appointment for that Wednesday, June 22. The doctor examined Nicole and said that everything appeared to be fine but decided to do a sonogram. The sonogram indicated that one baby had too much fluid. This condition is called TTTS (twin to twin transfusion syndrome). They rushed Nicole to the hospital and she was met by a team of doctors. The doctors said she was in a stage 4 condition of TTTS which is very serious. The twins had slight heart beats and the doctors suggested the following options to my daughter: A) Cut the umbilical cord of baby Taylor, the twin with too much fluid. Taylor would then die but possibly baby Alexa would survive. B) Take no action and at some point both babies would die. C) Deliver the babies immediately although there was no guarantee that they would live. My daughter had just a few minutes to make a decision and she chose option C and both babies were delivered via an emergency C-Section at Winthrop Hospital in Mineola, New York. The twins were delivered at 26 ½ weeks and a few minutes after birth were given the Apgar test which tells the general health of the newborn. The score is from one to ten, one being the lowest. Taylor received a score of one and medically had no chance of survival. Alexa was given a two to three score and had a slightly better chance of survival. While this was happening I received a call that the twins were dying and that I should leave my hair salon business and come immediately to the hospital. 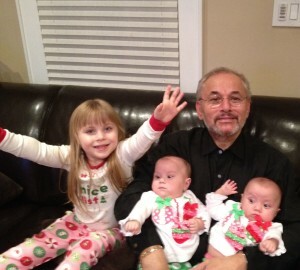 While driving to the hospital, which was forty-five minutes away, I prayed and cried, asking the Lord to save the twins. I felt in my heart that the Holy Spirit was speaking to me saying that they would survive. It took seventeen minutes to stabilize Taylor who was in grave danger and then both babies were placed in two separate incubators. I was surrounded by bad news for days so I took a picture of St. Pio’s bleeding hands and put it in the incubator with Taylor who was in critical condition. Alexa was in stable but critical condition. I had a strong desire to put a picture of Blessed John Paul II in the incubator as well. I had a 5 by 7 plaque at home of John Paul II but it was too big to put in the incubator. I asked my sister and family and friends if anyone had a smaller picture of him but I had no success in finding one. At this point I asked the Lord for His will to be done and prayed to St. Pio and Blessed John Paul II to intercede. A week went by and one of my customers came into the hair salon. He was seventeen years old and told me he had just returned from Rome and while praying in front of the tomb of John Paul II he felt led to get a picture of him and a medal and bring it to me. The young man said he didn’t understand it but he knew he had to do it. I put the picture in Taylor’s incubator and the rest was in God’s hands.